A Darling Kind of Life: DC, Cale & a little performance. DC, Cale & a little performance. Often I think about the people in my life. Friends and family...we are both so blessed. I struggle with how needy our life is. I hate that I can't invest in people the way I could before and it makes things a little more difficult when my life is so intertwined and consumed with Cale's life. Sometimes plans have to be cancelled or cut short. I can't always just visit and hang out. With Cale's brain injury, I have to be very sensitive to his needs which means other relationships in my life may not receive the attention they need. I'm constantly aware of it and continue to try to balance but there's not always a fix. The Lord has provided specific relationships that bring understanding and consistency. Even though I can't always invest in them like I should be or would like to be. They pursue me. They invest in me. I fully realize the gift and treasure they are! One of those people in my life is Rachel. As I said last night, she came to visit after a night that I really needed it. God used her without her even knowing about my need. So thankful! We had a blast while she was here! We had a lot of fun light moments as well as some deep tearful moments. Each part of the visit was perfect. The next morning we started with a run. We're running a half with Rachel's husband in February and we're all doing the same running plan. It felt so good to run next to her! The rest of the day was spent with Cale. He had a day pass so we ventured back on the metro after lunch and visited the Spy Museum. Awesome. We chose to do a mission which was a blast but I think the most fun was watching Cale enjoy it so much! It was very well done and set up. The mission started out with the guy stepping out of the room and asking all of us to hide. The group went different directions finding cover but us two girls had no where to go...so we sat on a bench and covered up with Cale's jacket. We were right where the guy walked back in and the first thing he said was, "I'm not going to say anything about the two blondes hiding behind one coat..." Ha! Once the mission actually started, Cale was in his element. It was so great! 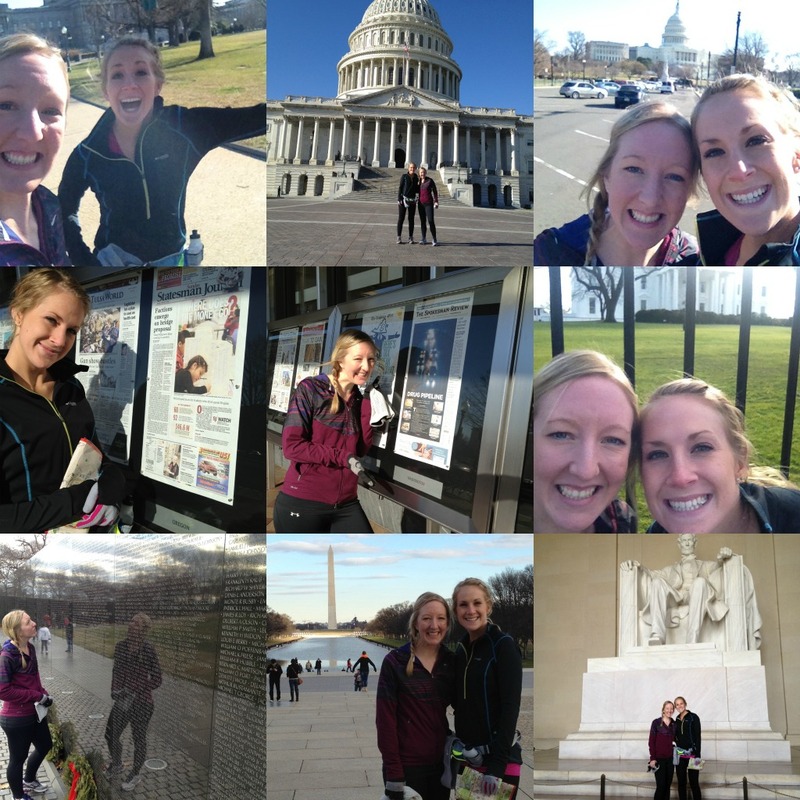 The next day Rachel and I put our running clothes on and figured out how to stash everything we needed, rode the metro, and ran DC! We carried a map that was actually for a bus tour but helped us figure out which direction to run. We started at the Capital building and picked our next point and ran! It was the best way to see DC in my opinion. You always get to see more on foot and running took less time than walking from place to place. It was an adventure I know we'll both remember for a long time! 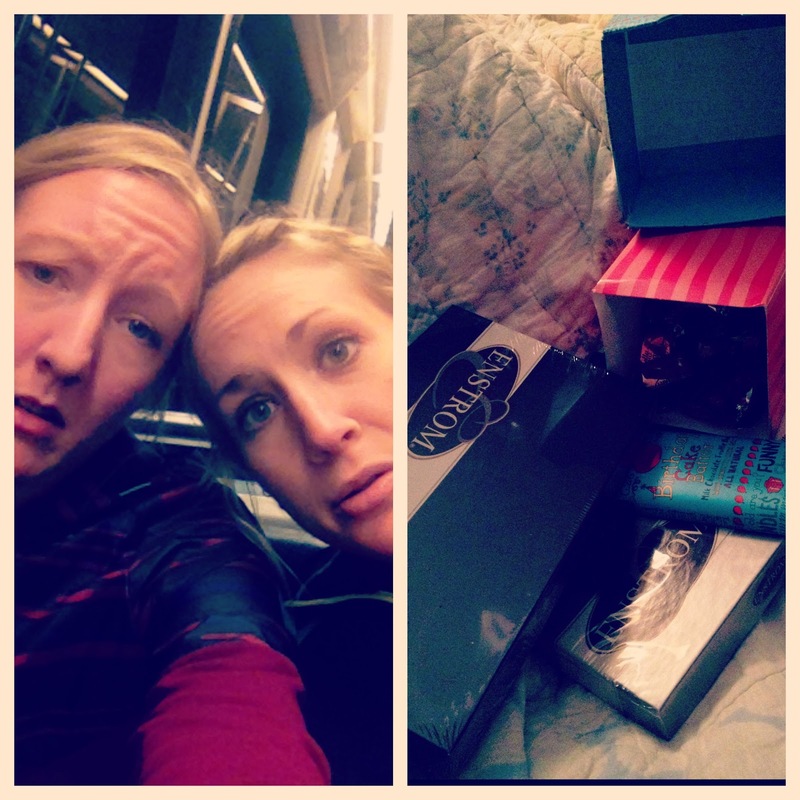 After such a long day we were ready for chocolate and a chick flick! Ahhhh....such a great visit. Great memories made. Great refreshment for the heart! I have to post this last picture and see if you think it's as funny as I think it is. Our faces and how silly we look kind of describe our trip and us in so many ways. Love her! On New Years Eve after yelling, "Yay!" drinking our sparkling cider, and sharing a kiss, we prayed for the next year and thanked the Lord for everything he did in the last. Cale started our prayer and his words showed spiritual depth and have stuck with me, "Dear God, please stay with us. Please. The Devil is here. Please stay." On New Years I asked him what he wanted to do he replied with, "Party like it's 1965." He loves playing jokes and tricking the nurses. It cracks me up when they'll be on their computers and he comes behind them and scares them! They all say they're going to miss him! Another trick he has played was when he was sitting in the dayroom eating breakfast, he stomped his feet and yelled pretty loudly. A couple of the nurses ran in to see if he was ok. When they reached the day room Cale was turned towards the door ready to shoot and fire his straw wrapper at them. Ambush! A couple weeks ago (I don't remember which day) Cale was finished with PT and on the way back something switched in him. He had been holding my hand but dropped it and slowed his pace way down. The PT and OT were walking behind us and they noticed the shift as well. We were walking in an area on the second floor that made the front doors visible. I was trying to figure out what was going on in his brain. Was he going to try to climb over the wall and jump? I knew he wouldn't make it over before we would stop him though. Closer to the elevators Cale picked his pace up and turned right and went right down the stairs. We all followed behind and when he finally made it to the bottom he walked himself right out the front doors! He had my phone in his pocket so I couldn't call the ward for help so i ran up as fast as I could and they went down. He was out of the hospital for about an hour! He wouldn't come back in and didn't want anyone around him. He still needs some help with walking outside and needs help with safety. His buddy just happened to be working that day and was the only person Cale would talk to. Eventually he got him back up! I'm sure I should have been more stressed or upset than I was...but it was all kind of funny to me. Cale just walked out the front door. Easy peasy. Have you picked up your soccer ball yet? Have you joined the Darling Project on fb? Have you told a friend about it? I encourage you (because we're really excited about it!) to join us. It'll be great! The first week of February we'll be announcing our next project! The other day we were in Cale's room (before he switched) and I had music on. It was later in the day and Cale was on his xbox while I sat next to him. A song came on that brings us both lots of memories from years ago and we still always have fun with it. We started to sing and then as Cale started to add moves...he suggested we show the nurses. Shift change was about to happen so I told Cale we could show them the next day. We decided to rehearse quickly that afternoon and when things had calmed down we gathered everyone in the dayroom and performed! We had so much fun! The next day we had to do it again for the next shift and one of our friends here made sure to get a little video of it! I think that about does it for today! I love what you said about Jesus having His scars...beautiful picture! About him walking out...it was a little scary but I knew people were with him. Once help came it became funny! :) Love you Marion! p.s. i would love to have you come visit! Awhh...I'm so glad you have such a special friend that came to see you. (Everyone needs at least one close friend like that!) The photos were so fun and I know you needed that visit! The video was so cute! What a special couple. Praying for you!! I agree! Everyone needs at least one Rachel! :) She has been able to visit every hospital we've been at so having her come here was extra special! Haha! You guys are great! That video is one of the sweetest things I've ever seen! I love how evident your love is. Thanks for sharing!